It’s healthy for our customers. Grass-fed and pastured meats have a healthier fat profile. 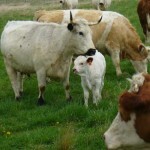 Jo Robinson lays out the benefits of grass-fed on her website here. It healthy for our animals. Fresh air and sunshine are always better for the animals. Don’t believe anyone that tells you they keep their animals inside for safety reasons or to protect them from the weather. At certain times of the year, our animals have a choice about whether they are inside or outside, and it amazes me sometimes, the weather that they will choose to be out in. Here’s a short video showing our ducks out waddling in the snow. It’s healthy for the planet. Permanent pasture-based agriculture is part of the solution to our carbon emissions. Here’s an article in Time that lays out the arguments . 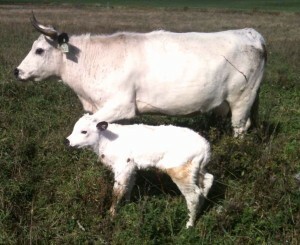 All the meat we raise is in a pasture-based system for as much of the year as is practical. We believe in fresh air, sunshine and grass for all our animals. Because of the pasture, our meat will have a healthier ratio of Omega 3 and Omega 6 fatty acids and our eggs will have a much higher beta-carotene content. We raise White Park cattle – an endangered breed that we’re working to rebuild in Canada. Click here for more information on the White Park. Because our primary goal is to rebuild the numbers of White Parks, our beef offering is only sometimes White Park. 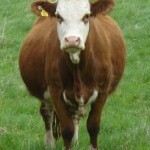 We also have a herd of Simmental and Angus cross cattle that supply our beef. 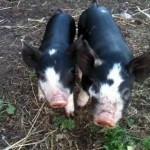 Our pork is primarily from Berkshire and Berkshire cross hogs. 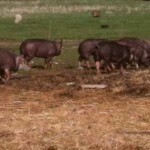 This endangered breed was found to have the best flavour of any pork in a taste test conducted by Ontario Pork (the marketing board for Ontario pork producers). But, it has black hair so none of the big packers want it, so you won’t find it in the supermarkets. 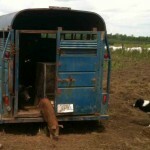 The primary marketing channel for our meats is through our meat CSA. This is an excellent way to get white cloth restaurant quality meat at an affordable price. 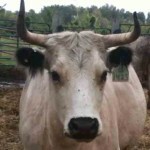 Click here for more information on our meat CSA. I am very interested in buying meat from you. I’ve done some research and can’t find very many TRUE organic and natural beef/food. I would love to bring my family out to visit your family farm if possibly? Just to make sure you’re not misinterpreting what we do. All of our land is certified organic but none of our animals are. Our lamb and beef are 100% grassfed and we use no growth promotants or sub-therapeutic doses of antibiotics. However, if an animal gets sick, we will give it medicine if needed. That said, very few of our animals need treatment in any given year. You’re welcome to come out and visit, we ask that you arrange a mutually convenient time in advance as we are a working farm and there is no guarantee that someone is in the yard at any given point in time. Thank you for getting back to me. Thats awesome that you are completely certified organic. Also do you know about if your animals are heritage/herlium. I don’t know anything about this so I’m just curious as to what it means. 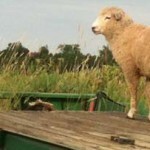 Does it mean your animals come from a long line of grass fed and hormone free and free range? I’m not to sure. I would love to pick a time and come to your farm. I can’t imagine how busy a farmers life must be. My husband and I both hunt so this time of the year our weekends are very busy, but let me know if you have time available for us to come visit sometime in the next few weeks?? Also if your animals get sick what do you do for them? Do you use antibiotics or probiotics? ps. I will also be bringing my two daughters 1 and 3 years old if you don’t mind.